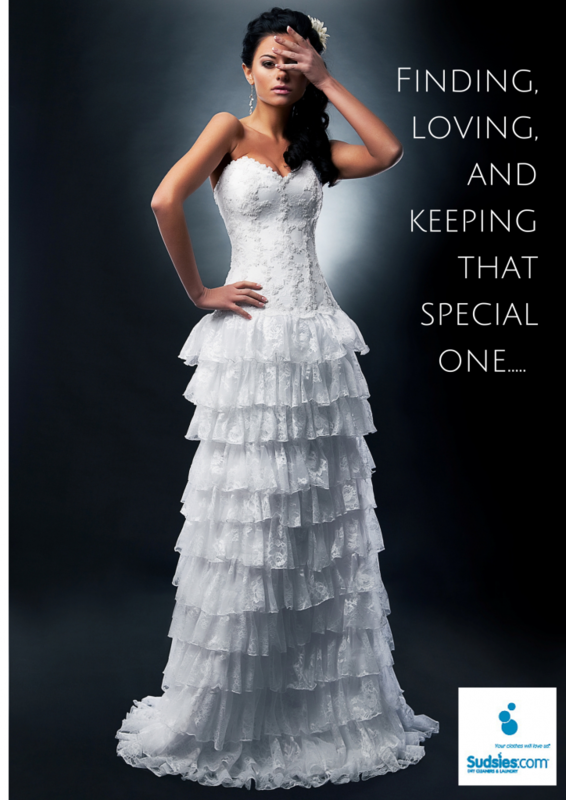 Finding, loving, and keeping that special one… your wedding gown safe. * Glued trim will never hold up as well as a trim that is sewed to the bodice. * Study the sewing quality of the embellishments, as you don’t want to leave a trail of beading behind you the moment you start walking down the aisle. * Hang the gown on the loops connected to the side seams… NEVER by the straps themselves, as the weight of the dress can stretch or even tear delicate straps or sleeves. * As pretty as it looks in front of a window, hang your dress away from sunlight, as well as ventilation ducts. Save those beautiful window shots for the photography session only. * Aim high to prevent pooches and kitties from using your gown as a napping spot, or children from using it as an art canvas. * Cover your gown with unbleached muslin… NO plastic or suffocating covers. * Apply all makeup, hairspray and perfume BEFORE putting on your gown. Then make sure that all of it is completely dry to avoid bleaching, fading, or other stains. * Make sure whenever someone is handling your wedding dress that they wear clean white gloves to avoid oils or other resides from transferring onto the dress. Also, make sure all jewelry is removed that could potentially snag the fabric or embellishments. * Clean it as soon as it is possible, as with time, stains oxidize and become more difficult to remove. * Keep in mind that wedding gowns attract a range of stubborn stains: grass, mud, makeup, alcohol, etc. over the course of the big day. Talk to your cleaner about the risks involved with more aggressive removal techniques. You may opt to forgo the option, but understand that even the faintest trace stains could potentially oxidize and discolor over time. * Place your dress in a cool, dry place. Never store in plastic, as this traps in moisture and can lead to mildew. Opt for an acid-free, PH neutral, and lignin free box or white muslim if hanging to help air ventilate and prevent yellowing. Sitting in a lonely box and waiting for your daughter to potentially don the gown on her special day is a gamble. Here are some ways you can bring back life to your gown now. * Place in a shadow box and create a leaning wall artwork. * Fit the dress on a vintage mannequin frame for a romantic, dreamy decor accent. * Re-sell it. Hey, you could apply that money towards your honeymoon or towards your new home. Some sites to check out are Ruffled, 100 Layer Cake Marketplace, and Weddingbee Classified. * Donate it. Pass on the wonderful memories your gown helped create for you to someone else. DonateMyWeddingDress.com offers a full list of charities across the nation. Wedding dress cleaning and preservation with Sudsies includes a complimentary consultation to discuss the best method for your particular dress. Upon drop-off, the gown undergoes a 12-point inspection, analyzing the materials content, embellishments, staining and any damage. The gown is then sent to respective departments to undergo hand treatments and tailoring to mend and reinforce beading, lace, trim, etc. All of our processes are 100% organic and safe for both the bride and the environment. When the gown has been entirely cleaned of visible and invisible stains, it is hand finished and sent to our preservation department, where it is placed on an acid-free bust form and laid into our white handled, PH neutral, lignin free preservation chest with a clear viewing window. Layered within is acid free tissue to prevent wrinkling. This packaging creates the perfect environment for long term storage with a 100 year guarantee. Say yes to Sudsies! To learn more about our bridal services or schedule a complimentary consultation, call 1.888.898.SUDS (7837) or visit www.sudsies.com. This entry was posted on April 29, 2015 at 12:10 am, and is filed under Memes. Follow any responses to this post through RSS 2.0. Both comments and pings are currently closed.